30 years can safely be considered an eternity in a fickle industry such as music. Changing tastes, corporate culture, and demographics each play a part in dictating what the public at large is exposed to over the course of an artist's career. But then, there are remarkable exceptions. When thinking about the sheer vocal power and inimitable way with a song that Whitney Houston possessed, three decades seem more like one moment in time. Whether caressing a gentle slow-jam, pouring her heart into an inspirational number, or rousing listeners with uptempo floor-fillers, her delivery of words and melodies was (and remains) remarkably relevant—no matter the year, genre, or venue in which she was performing. 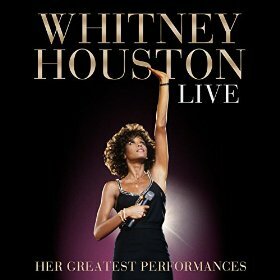 The newly released Whitney Houston Live: Her Greatest Performances collects 16 songs performed by Houston in concert and on TV specials from 1983 to 2009—almost the full span of her recording and touring career. Beginning with a stirring rendition of "Home" from The Wiz performed on The Merv Griffin Show and closing with a poignant rendering of "I Didn't Know My Own Strength" (from her final album, I Look to You) on The Oprah Winfrey Show, the CD serves as a golden time capsule of not only professional triumphs, but breathtaking interpretations that continue to resonate with listeners of multiple generations and nationalities. Although each selection on Whitney Houston Live represents a unique characteristic of the late songstress' finesse, her take on "You Give Good Love" from a 1985 taping of The Tonight Show with Johnny Carson is one of the most striking to listen to now. The soft side of her soprano range is showcased in all its reverie here. While she employs forte execution during the chorus and bridge, she displays a lovely tenderness in the verses that is significantly different in tone than the more brazen approach for which she is widely revered. And when the background singers flub up a key line, her effervescent command of the melody doesn't miss a beat. Continuing that early chapter in Houston's solo recording career, "How Will I Know" (from the 1987 Brit Awards) finds her beaming with youthful energy through the pop-dance number's lovesick lyrics, dropping in seamlessly appealing ad-libs with a gritty edge that add notably to the fun. A similar buoyancy is found in her performance of "I Wanna Dance with Somebody" at Arista Records' 15th Anniversary Concert. The band brings the tempo up a bit from the original studio recording, and Houston's interaction with the backing vocalists is contagious. Possibly two of the most iconic moments on the CD appear via Houston's robust conveyance of "One Moment in Time" from the 1989 Grammy Awards and her heartfelt reading of "The Star Spangled Banner" from Super Bowl XXV. The former tune, originally recorded for the 1988 Summer Olympics, is here given the royal treatment at a slightly slower pace that allows plenty of room for the climactic bridge and chorus modulation to send chills up one's spine. As she brightly asserts, "You're a winner for a lifetime, if you seize that one moment in time…make it shine," the spirit of the games becomes transparent. The performance of the national anthem, meanwhile, remains an emotionally charged experience. Recorded while America was immersed in the Gulf War, and re-released ten years later after the 9-11 attacks, Houston's rich and bold feeling with every word is nothing short of triumphant. Moving into the 1990s, Whitney Houston Live highlights renditions of signature songs from The Bodyguard, I'm Your Baby Tonight, and My Love Is Your Love. Three numbers from 1991's Welcome Home Heroes concert are included, the most outstanding of which is "All the Man That I Need." Two selections from the 1994 Concert for a New South Africa are also featured. While Houston sounds a bit fatigued on her performance of "I'm Every Woman," she retains the spark that made her remake of Dolly Parton's "I Will Always Love You" the definitive version. The same cannot be said for her delivery on "I Believe in You and Me" at the 2004 World Music Awards—an appearance lacking her usual zest and dynamic range. The concluding "I Didn't Know My Own Strength," from Houston's comeback appearance on The Oprah Winfrey Show in 2009, is at once an uplifting and bittersweet tour de force. The beautifully penned Diane Warren number serves as the ideal musical summation of the Whitney Houston story. Having suffered for years in her personal life with spousal abuse and drug abuse, the song was an emotive anthem for Houston as she rised up against the demons in her life to reclaim her gifts and show the world that she still had the gusto to utilize them to the fullest. While her technique may have not been at its peak here, the combination of luster and determination with which she had initially taken the world by storm showed signs of resurfacing. Some of the phrasing is a tad choppy; but the core of Houston's one-of-a-kind tone and sincere energy shines through. We can only wonder if she might have taken that momentum to renewed heights had the circumstances of her career shortly thereafter taken a different path. Whitney Houston Live is a thoughtfully assembled package that aptly demonstrates what made fans flock to see the incomparable performer in concert year after year, decade after decade. The variety of performance venues represented on the CD result in a collection that finely showcase the timeless singer's ability to make the most out of any material she tackled. The unforgettable songs featured are testament to the lasting power of her style and authenticity. Highly recommended.